HLOGOTLOU - "When Duty Calls" was on Tuesday 2018-05-08 put to practice when a Warrant Officer who is on official annual leave placed himself on duty and assisted in foiling a business robbery that was about to take place at Sephaku village in Groblersdal Cluster. It all started with a message on the whatsAPP group which the member read, detailing information about the suspects who were about to rob the local shop. True to his calling, the member, who is attached to Zaaiplas police station as Visible Policing Commander, jumped into his private vehicle without hesitation and proceeded to the scene. The self-propelled and hardworking Warrant Officer immediately sprang into action on arrival at the scene and took position together with members of the local police station. The members then pounced on the two suspects who at first attempted to evade arrest. One of the suspects produced a firearm but was shot in the leg before he could use it. Both were apprehended. The second suspect was found in possession of an Okapi knife. 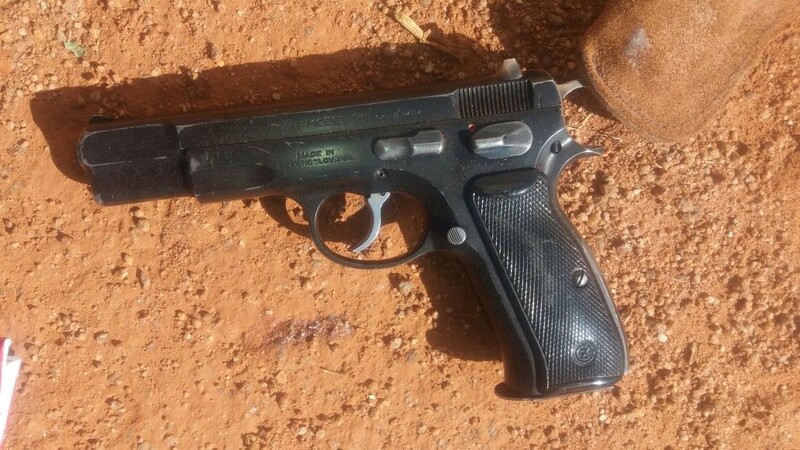 One pistol was confiscated and will be sent for ballistic examination to determine if it was used in the commission of other crimes in the country. The suspects will be charged with Conspiracy to commit Business robbery and possession of illegal firearm and dangerous weapon.